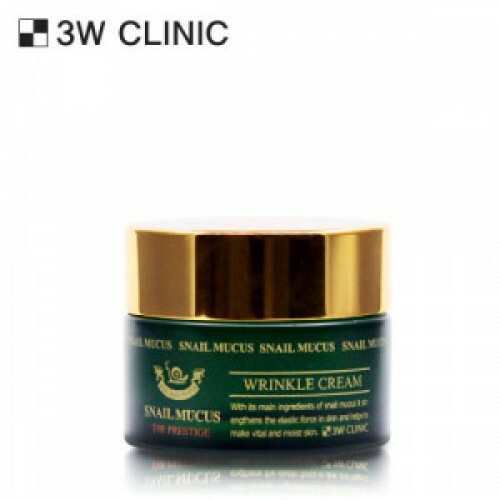 3W Clinic Snail Mucus Wrinkle Cream quickly soothes troubles and stabilizes irritation from external environments, while preventing and repairing skin damage to keep the skin radiant from the inside with the main source of snail secretion filtrate, chondroitin sulfate. In addition, high molecular weight hyaluronic acid intensively hydrates for a dewy skin. The main component of snail's slime, chondroitin sulfuric acid, cools down your skin troubles and prevents or improves damage on your skin to maintain a youthful, glossy glow all year around.